Chocoholics will be pleased to learn that these brownies might be lower in both fat and sugar than traditional brownies, but they’re just as rich and satisfying. 1. Heat the oven to 190°C, gas mark 5. Melt three-quarters of the chocolate in a large heatproof bowl set over a pan of gently simmering water. Remove from the heat and stir in the sweetener, muscovado sugar and cofee granules. Set aside to cool slightly. 2. In a small bowl, beat together the egg, buttermilk and mayonnaise, then stir into the cooled chocolate mixture. Scatter in the remaining chopped chocolate. Sift over the cocoa powder, flour and bicarbonate of soda, and gently stir together. 3. Pour into a lined, 20cm square tin and bake for 25 minutes, until just firm. Turn of the oven, open the door and leave to cool completely. Gently turn out and remove the paper. Cut into 20 squares. Stevia is a natural sweetener derived from the leaves of the stevia plant. It has a very low calorie count and is much sweeter than sugar. 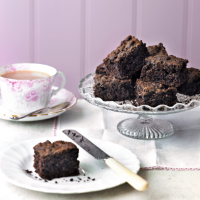 In this recipe, we’ve replaced 100g sugar with 35g Truvia sweetener. Other forms of stevia, such as crystals or cubes, vary in sweetness per gram and cannot be interchanged with the granules used here.